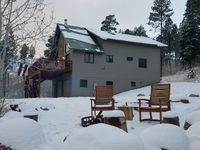 Bayfield Home 10 minutes To Vallecito Reservoir! 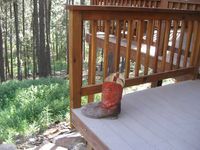 Property 5: Bayfield Home 10 minutes To Vallecito Reservoir! Property 8: Natural High is Stunning with 3 bed., 2 bath, waterfront and private! New To Market! Location! Location! Location! Property 27: New To Market! Location! Location! Location! Home - 5 Stars. The house was everything as advertised and more. Absolutely loved it!! clean, comfortable, welcoming well stocked, secluded and so very relaxing. The views were incredible and everything i wanted. Note that if you go in the winter BRING AN AWD or 4X4 (no joke!!) Owner - 5 Stars The owner's service was incredible she went above and beyond to help us when we got stuck in the snow (see above warning). She was so friendly and understanding everytime we talked to her and interacted. The directions and information she left in the house were clear and concise and pretty much covered everything. Neighbors - 5 Stars After being stuck in the snow the neighbors were friendly and helpful and they also went way out of their way to help us and make sure we were ok. Location - 5 stars Secluded, beautiful views, quaint and relaxing. Durango is about 40 minutes away and there is a restaurant/groceries/gas/ store 3 miles away that has great food. They make every kind of food. I hope to come back again and stay more days. Thank you so much for everything! !